If you regularly receive proper eye exams, you have a good chance of maintaining good eye health throughout your life. However, as you age, the chances of developing an eye condition increase. As a senior, caring for your eyes and your vision becomes even more important. Here at Maple Ridge Eye Care, we take special interest in senior eye care. We work with our patients to ensure that each individual receives the right amount of professional attention to spot these conditions early on. 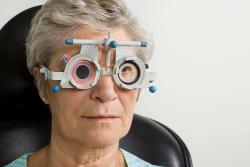 Cataracts - Cataracts can cause you to have blurred spots in your vision, an increase in light sensitivity, and even blindness if left untreated. It is caused by a clouding of the ocular lens and is treatable through surgery with a qualified eye surgeon. Glaucoma - Glaucoma is an eye disease that causes damage to the optic nerve which is often the result of unstable eye pressure. Being a senior puts you at a higher risk for this disease, but so does a family history. Dry Eye Problems - Seniors often have problems with adequate tear production to keep their eyes moistened. The eye doctor can help track down the cause of dry eyes and advise what you can do to alleviate the symptoms. Age-Related Macular Degeneration - This eye condition, often called AMD, is a disease affecting the macula, which is a light sensing area at the back of the eye. Problems with AMD can cause loss of central vision, either in part or completely with progression. At Maple Ridge Eye Care, we are a full-service optometrist serving Maple Ridge and Pitt Meadows and surrounding areas. If you would like to know more about how your vision changes as a senior or would like to set up an appointment, contact our office today.